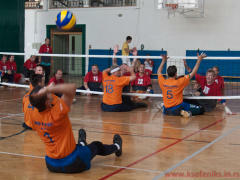 In Szeged already, we knew that we almost have the bronze in our hands! Here in Vác we were supposed to win two teams from the bottom of last year's league table: Csakazért SE - Szeged (text about them is here) and Hamburger - Nagykanizsa (the last placed team). The team which Csakazért had in field in the second round of Szeged could not beat us, but we did not met there according schedule. What kind of team will come in Vác? Will the medal be ours? Time will show. 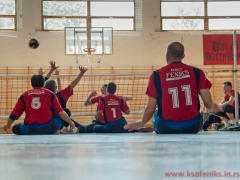 Schedule was a little disturbed, so we were warming up for the match against Szeged watching Mozdulj (Vác) : Sprint (Szombathely). It's hard to watch the match in which others are to decide your fate. 3:0 for Vác, fair and as we desire. In the meantime, it our opponents emerged there in the strongest release. 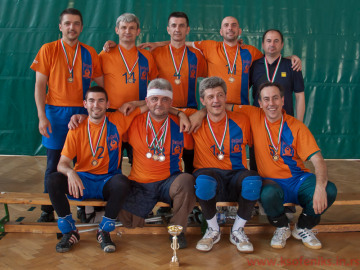 Thus the team KSO Feniks won the trophy for the third place and the bronze medal in Hungarian championship for year 2011! Last year's fourth position was already a significant success, but now we made a great step forward, towards the top. The fight for the next step starts in autumn. 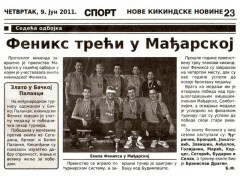 Well, we even won the team of Vác last year... Who knows what would happen if we crossed the spears in Nyíregyháza? well, just take it eeeeaaaassssy!